ISTE describes FUNecole® as “a comprehensive learning platform for primary and elementary grade students to teach important social-emotional skills for living in the 21st century”, with “digital learning concepts and tools employed to teach these concepts from year one to year six”. By allowing students to set goals, to reflect on their learning, for giving them choices to demonstrate new learning, and for scaffolding the application of technology operations (3/4). For including research activities, using a variety of media sources to construct artefacts, and the curriculum focus on real-world questions and issues (3/4). By challenging students to use a variety of design methods, select from recommended tools options, design and test with concept mapping and flowcharts, and working with open-ended problems (4/4). By allowing students to created original work that demonstrates new learning in each activity, choosing appropriate tools or strategies, communicating complex ideas, and share artefacts with peers and others (4/4). For engaging students in collaborative teams or pairs in the majority of activities and allowing students to explore local and global issues through connected themes (2/4). “FUNecole® provides teachers with a seamless way to direct students to apply their knowledge of critical software programs and web applications in unique activities focused on developing social and emotional skills. Students are provided with scenarios that reflect real-world, authentic, age-appropriate issues, then use a wide variety of tools and strategies to communicate their opinions, arguments, and reflections. FUNecole® offers a unique platform that facilitates the implementation of the ISTE Standards for Students by providing a variety of activities that integrate key applications, programs, and problems. While the focus of FUNecole® in on the learning themes, FUNecole® successfully embeds technology strategies as an integral part of the learning experience. The International Society for Technology in Education (ISTE) is the premier non-profit membership organization serving educators and education leaders. ISTE is committed to empowering connected learners in a connected world and serves more than 100,000 education stakeholders throughout the world. Resources and products designed with the ISTE Standards in mind are choosing to demonstrate their commitment to support critical digital age learning skills and knowledge. 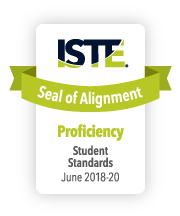 By addressing the ISTE Standards and earning a Seal of Alignment, a solution is shown to consciously, purposefully and meaningfully support best practices for digital age teaching and learning.